In late October we had some family business to tend to in San Diego, mostly involving getting an aunt's house ready for sale, as she no longer needed it (small house -- actually what we used to call a trailer). Mom and brother Bruce boarded Southwest out of Philadelphia, heading for Los Angeles. On Monday, October 26, we went to a taping of The Price Is Right, then headed down to San Diego in the evening. Upon arrival, we found that the local church had already done most of the work, and a friend of my aunt's was willing to drive Mom around to take care of paperwork. That left me and Bruce with four almost totally free days to explore deep Southern California. Woo hoo! 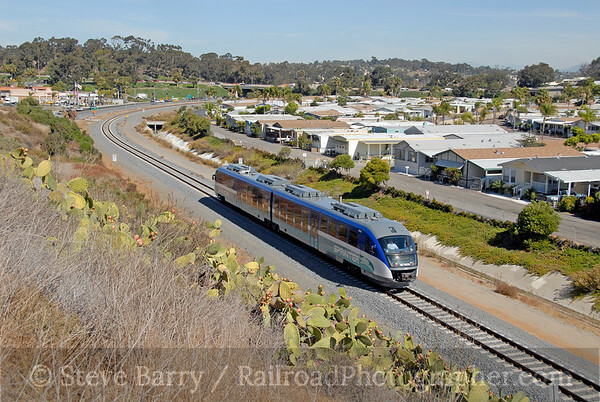 An ocean fog had blanketed much of the coast around San Diego, so after trying to figure out what to do we headed inland to Escondido, the eastern terminus of the diesel-powered light rail Sprinter service to Oceanside some 22 miles away. We started at the Escondido station, getting a few photos. Since service is only every 30 minutes, we decided that moving from location to location by auto (instead of riding the train) would maximize our photo output. After several shots at Escondido, we moved on to the Nordahl Road station for a few trains. At the Cal State station in San Marcos, we opted not to shoot at the station (lack of parking being one reason), so found a perch just east of the station that gave a nice elevated view of the railroad. Most of the line is on an old ex-Santa Fe branch (and indeed there is still freight service to Escondido), but the light rail line at San Marcos is on new right-of-way, eliminating a lot of grade crossings (freight still uses the original right-of-way). At the San Marcos Civic Center station we shot a train or two passing the junction where the western end of the new right-of-way joins the original line. 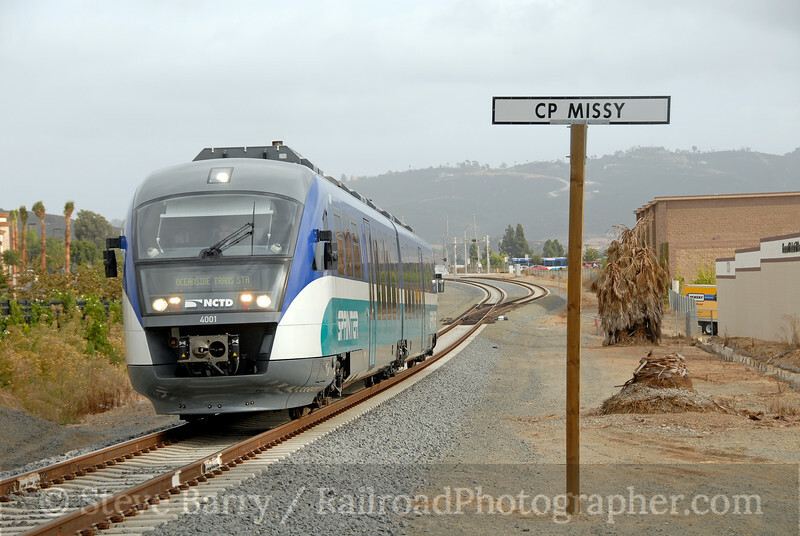 A long passing siding goes through the Palomar College station, so we got a few shots there, then finished up at the western end of the double track at CP Missy (named for parallel Mission Boulevard). Hard as it is to believe, in a complete afternoon we only covered about a third of the line. That just means we have to try again sometime! Just a few months previous (March to be precise) we had been in California for Winterail in the Bay Area, but included Southern California in the trip. We had spent a day in the Del Mar area, but persistent ocean fog made for a less than fully productive outing. Today was different. 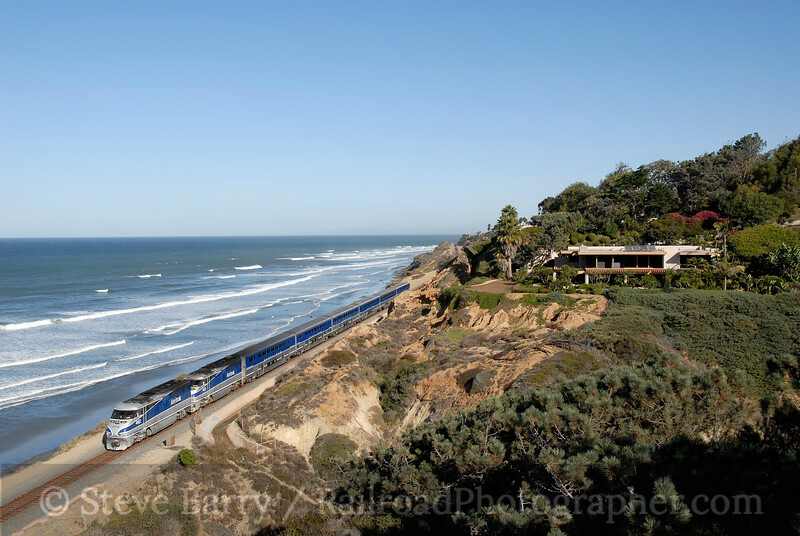 We arrived in Del Mar under sunny skies and immediately knocked off a scene that we had gotten skunked on in March -- a Pacific Surfliner passing a very expensive house on the coast. Del Mar is located about 20 miles north of San Diego and is in the heart of where the Santa Fe followed the coast from below San Juan Capistrano southward. 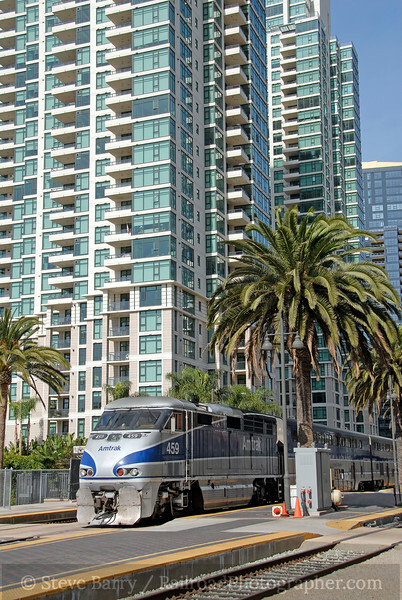 Today it sees frequent Amtrak service (the trains are push-pull with the locomotives on the south end) and Coaster commuter service between Oceanside and San Diego (push-pull with locomotives on the north end). 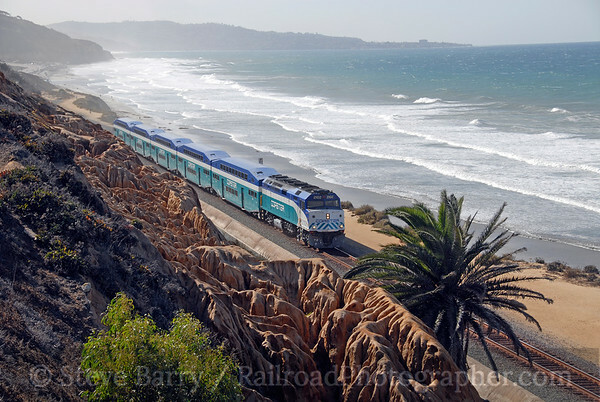 After successfully getting our southbound Amtrak train, next up was a San Diego-bound Coaster. Since it would be pushing (and thus the locomotive's headlight would be out), we opted for a broadside shot with the ocean as a backdrop. A northbound Amtrak train would catch our attention next, with a northbound Coaster following. The Coaster sure looked good along the cliffs! After another northbound Amtrak, we left the cliffs and headed north of the old Del Mar station (no longer used as such) for a few more trains. We worked our way up to Oceanside, where Coaster service ends and Metrolink service into Los Angeles begins, plus the Sprinter comes in from Escondido -- Oceanside's station hosts passenger trains from four different operators! We found a nice hill to shoot the Sprinter from just west of downtown, but were just a few minutes late getting into position. We put that shot into the memory banks to try again later in the week. After shooting the Sprinter in the station, we headed to the bridge just north of downtown and shot a southbound Amtrak. Unlike Amtrak and the Coasters, Metrolink doesn't seem to run its locomotives consistently on one end of the train, so it's a guessing game if you'll get a locomotive or cab car leading. We hedged our bets and set up for a broadside on the bridge. We hadn't been to San Clemente in -- gosh -- 18 years (hard to believe), and wanted to shoot there. Unfortunately, since our last visit things had changed. There's a lot more fencing and trees between the tracks and beaches and we found shooting there to be challenging. We just barely caught a southbound Amtrak, then got a going-away view of a northbound Amtrak followed by a very nice view of a southbound Metrolink train. 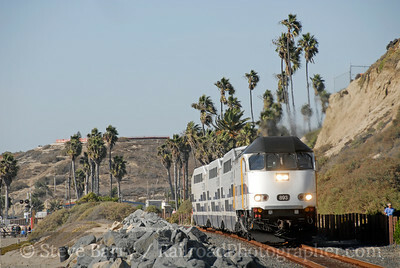 A few more Amtrak trains and a Metrolink (cab car leading, but ncie shot) rounded out our San Clemente visit. 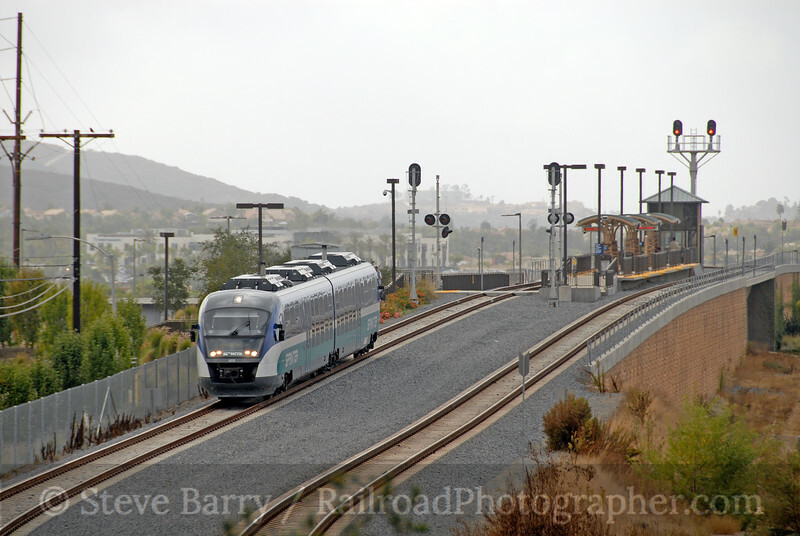 For a grand finale, we headed back to Oceanside to get those pesky what-end-is-the-engine-on Metrolink trains. A broadside of a northbound (with the locomotive pushing) rounded out the day. We parked the car at the Arnele Avenue station on the far north/west end of the combined green and orange lines (since we were staying near El Cajon on this trip) and boarded a northbound car to get to the end of the line. After a stop at Gillespie Field (end of the orange line) we went on to the end of the green line at Santee Town Center, one of a few stations located adjacent to a mall (this sytem really knows where its customers want to go!). Retracing our route back towards San Diego, we stopped at Amaya Drive for a few shots. I could see a young transit cop talking on a cell phone and, sure enough, when he was finished he wandered over to us. "You can't take pictures of the trolley," he said. "There's no law against it," I replied. "I was on the phone with my sergeant and he said we can't have people taking too many pictures." "Why?" That led to the standard 9/11-security-terrorist speech. I tried not to roll my eyes. "There's no law against it. We're out here all day, and if your sergeant has a problem with that he can come find us." With that, the transit cop wandered off. Never did see another one. 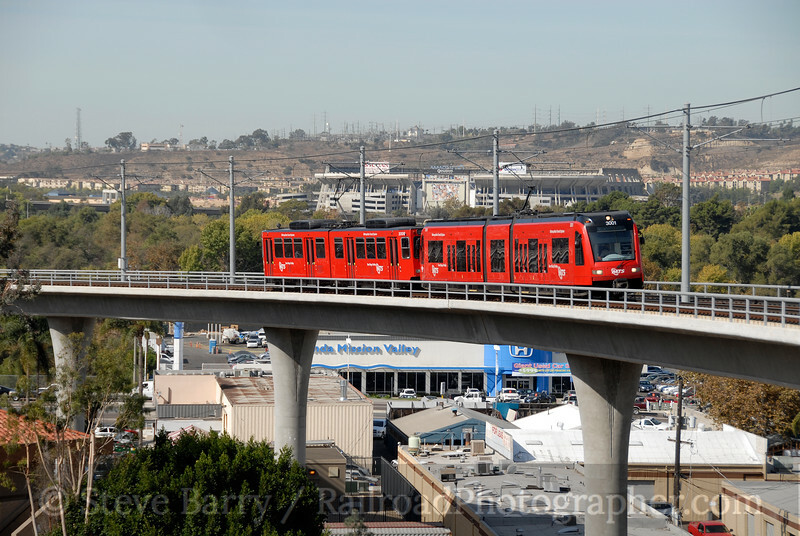 Our next stop was the elevated Grantville station, where we were able to get some nice telephoto shots of the trolley passing Jack Murphy (I refuse to call it Qualcomm) Stadium, home of the San Diego Chargers. From there, we paused at the Stadium station (also elevated) for some more shots. At the Old Town Transit Center the green line ends and the blue line begins. We spent several minutes here waiting for an Amtrak train and a Coaster to come by on the parallel main line. One operator wanted her picture taken in her trolley (whatever happened to that "no photos" stuff we encountered earlier) and another operator acknowledged that a lot of "foamers" worked for the transit system. Friendly people. 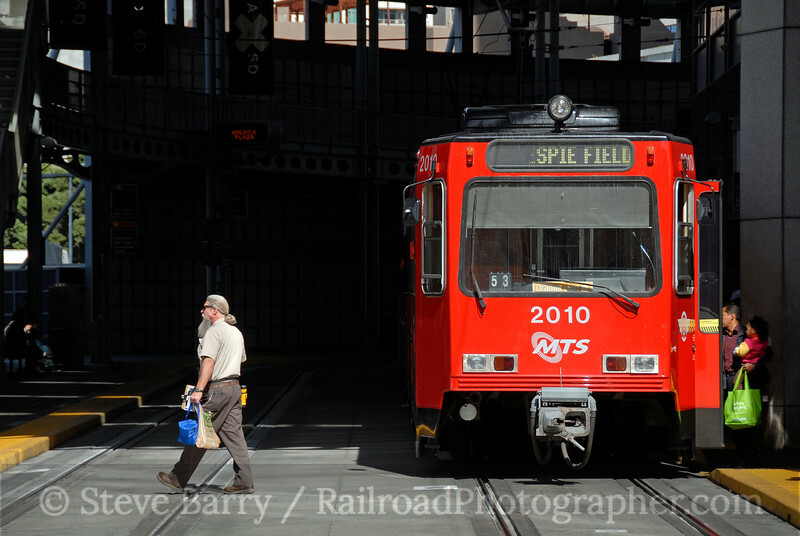 Continuing on into downtown San Diego, we stopped at the ex-Santa Fe depot to shoot Amtrak and some streetcars. A Coaster was also in the station, getting ready to head north. The area around the Amtrak station is target-rich, and we found plenty to see and photograph here. Across the street from the Amtrak station is the busy America Plaza trolley station, a transfer point between the orange line back to El Cajon and the blue line on its way to San Ysidro. The downtown area provide a lot of shooting opportunities. 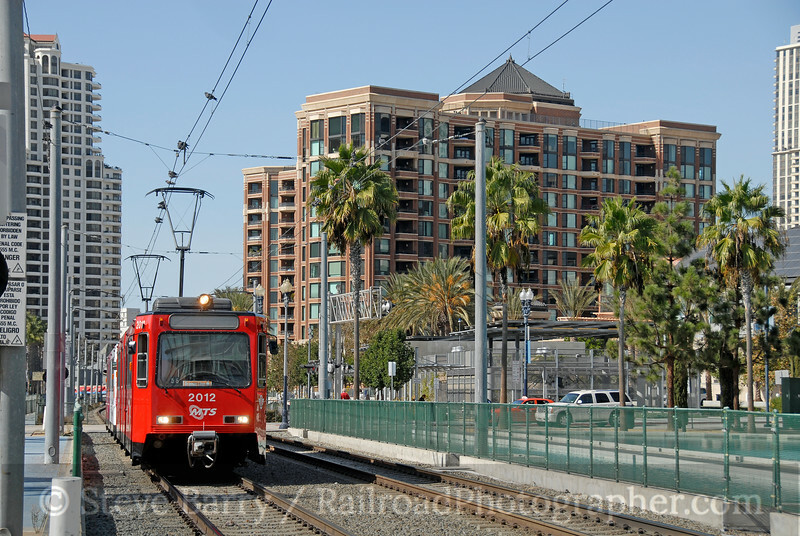 The area around the Convention Center in San Diego is full of nice buildings that make for a good photographic backdrop, so after finishing downtown we hopped on an orange line train and rode it to its terminus (which just happens to be near the Coaster maintenance yard). Riding back, we got off at the Convention Center station to shoot streetcars, and even got a northbound Coaster coming out to go to the station. Nice. Time was rapidly not getting on our side and we had to get back to El Cajon. Just to be different, we rode the orange line back. This has more street running in the city than the blue line, and it passes through some of the grittier parts of town. It was quite a contrast to the area by the Convention Center. We rode non-stop to the Grossmont Transit Center, passing old railroad stations in Lemon Grove and La Mesa (and even a steam engine on display in the latter). At the Grossmont Transit Center, where the green line rejoins the orange line, we headed away from our final destination, returning to Jack Murphy Stadium to get a few shots that the light hadn't been quite right to get in the morning. 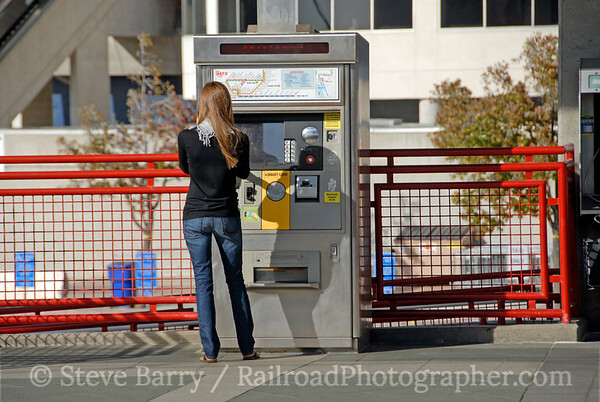 Believing that to tell the whole story you need to photograph people interacting with the transit system, I shot a passenger buying a ticket from a vending machine. After finishing up at the Murph, we headed back to Arnele Avenue and our car for the return trip to El Cajon. We needed to bid farewell to the San Diego area on this day and get back up to Los Angeles for the flight home. After taking care of some loose ends in the morning, we set out and took care of some photographic loose ends. First up was getting a trolley passing the steam locomotive on display in La Mesa. 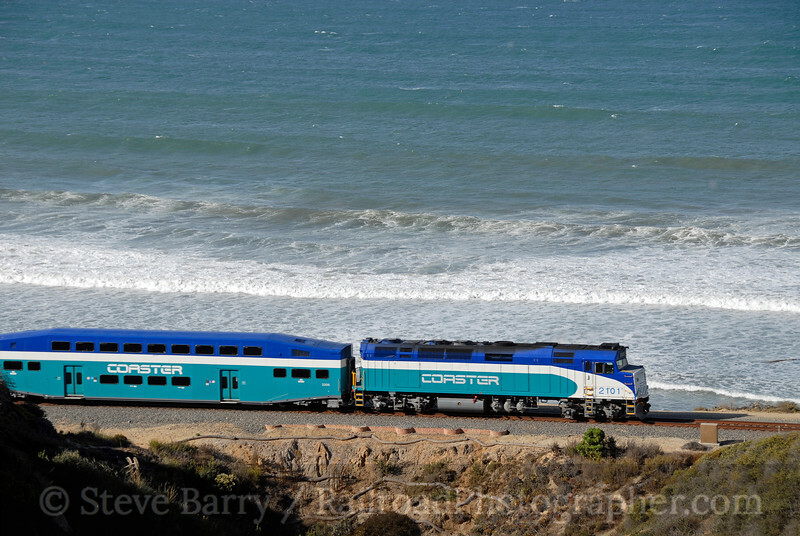 Then, using a timetable for a guide, we intercepted a couple of Amtrak Surfliners, one near Sorrento Valley and another at Carlsbad. At Oceanside we stopped to get the shot of the Sprinter from the bluff that we had not quite gotten right a few days before. We had a motel reserved near Los Angeles International (preparing for an early-morning flight the next day) so we dropped Mom at the motel and Bruce and I headed for San Pedro. Bob and Diane Gallegos (from Milwaukee) were also in California, so we met up it them to chase the San Pedro streetcar around. 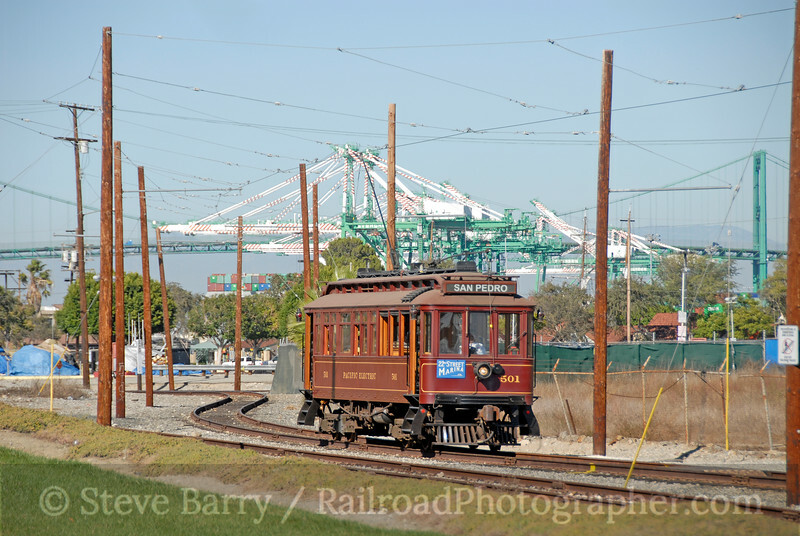 Primarily a tourist operation, the streetcar serves the cruise ship dock area of Long Beach, bringing back memories of the old Pacific Electric that used to serve San Pedro. Bob grew up near Long Beach and knew his way around, so after getting the streetcar we set off exploring the Ports of Long Beach and Los Angeles. Despite it being a prime target for terrorists smuggling in small thermonuclear devices (according to the press), the Ports have a surprising number of public access points to watch containers being unloaded and to watch the Port's railroad, Pacific Harbor Line. We came across a ship unloading containers from CSX; these weren't containers full of Chinese imports, but rather empty containers for domestic use that were constructed overseas (domestic containers are larger than ocean-going ones). 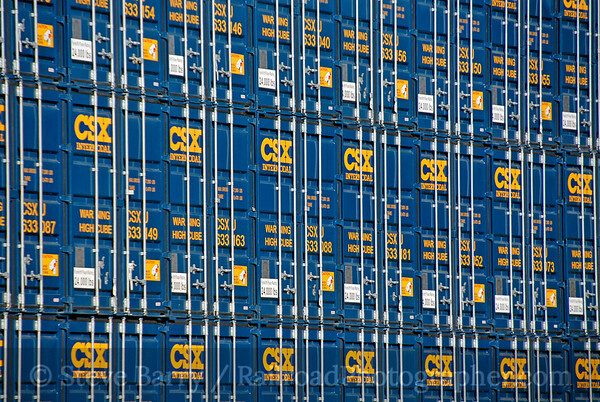 We all clicked away at the stack of new containers and got some great stock images of port activity. Finished with the containers, we headed towards Anaheim Street looking for Pacific Harbor Line action. 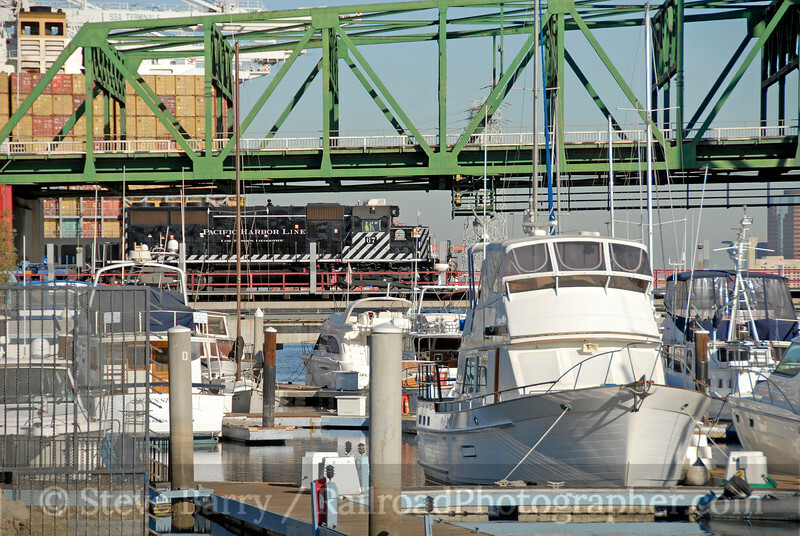 We were rewarded with a train crossing the bridge onto Terminal Island, which we shot from a marina. We later caught up with a BNSF train on its way out to ITS. All good things must come to an end, and that was the case for our trip. Bob and Diane, like Bruce and I, had dinner plans, so we said farewell and went our separate ways. A nice dinner, a short night, and it was back on Southwest to Philadelphia, leaving sunny California behind.